I remember one evening over 8 years ago, I cooked curry chicken for dinner. But right after cooking I just didn’t have the appetite for it at all, and even had a little nausea. I didn’t know what had happened, until a month later I found out I was pregnant with our first child Alexander. I stayed away from this food during that pregnancy. 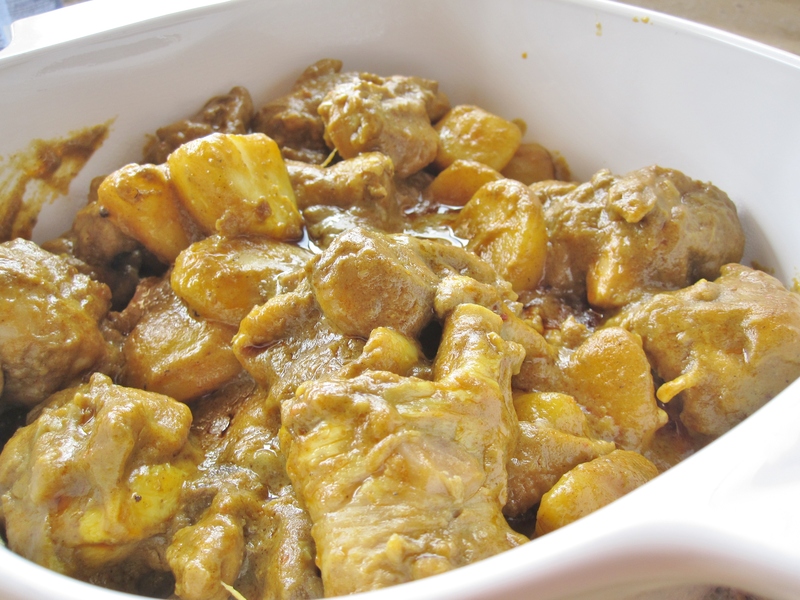 Even after I gave birth to Alexander, there was a period of time I was hesitated to eat curry chicken again. Thank goodness the fear went away! 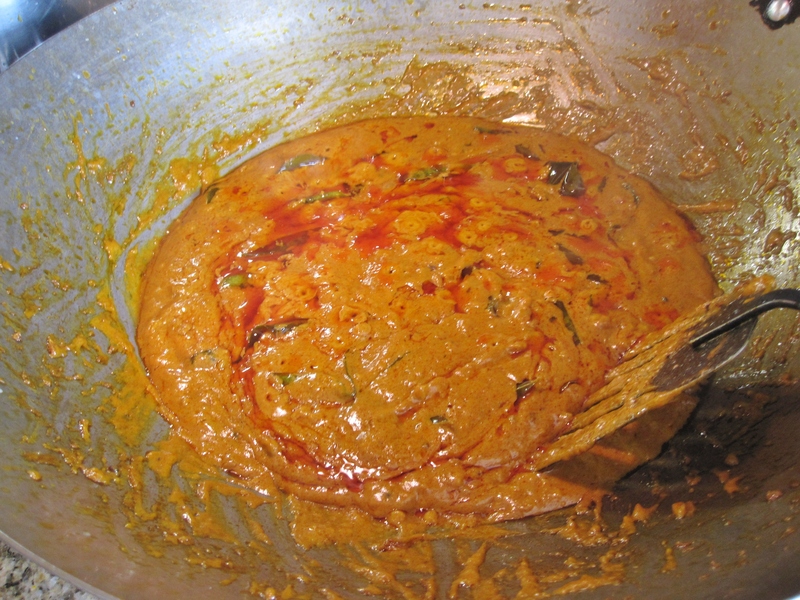 Prepare curry sauce: Heat up 3 tbsp oil in a frying pan over high heat. Saute buah keras and curry leaves briefly until aromatic. Add in curry paste and sambal chili, stir for a few minutes. 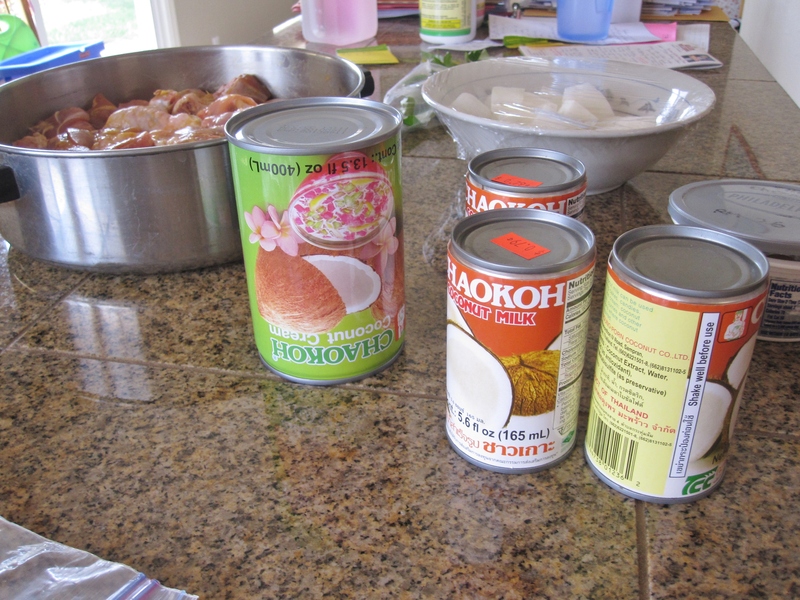 Pour in coconut milk and turn down to medium heat. Stir constantly to prevent burning at the bottom. Cook until the sauce bubbles with red oil sipping out from the bubbles (I call it “volcano eruption” :-)). At this point the sauce should be aromatic. Continue stirring curry sauce for a couple of minutes. The consistency of the sauce will look like oily mud (I call it “lava” :-)– see picture below). Set aside. The sauce can be prepared ahead and kept frozen in batches. Clean chicken pieces and rinse well. Rub chicken with 2 tbsp of salt and curry powder. Season for 30 minutes. Meanwhile, peel potatoes and cut into big chunks. 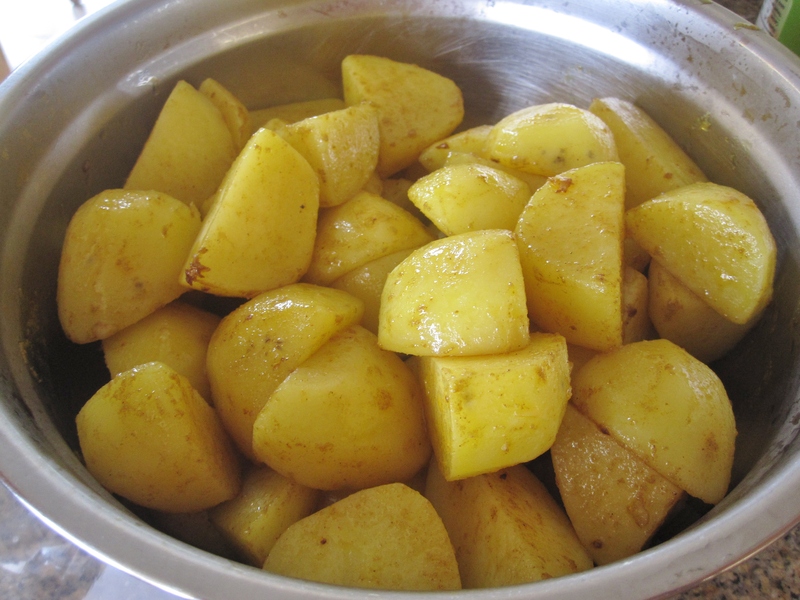 Soak potatoes in lightly salted water to prevent browning. Drain when ready to cook. Heat up 3 tbsp oil in a wok over high heat. Add potatoes and stir for a few minutes (potatoes are partially cooked). Dish out but maintain high heat. Add in 2 tbsp oil and saute garlic briefly. Add in chicken pieces, stir constantly until there’s no more blood coming out from the bones. Pour in coconut milk, potatoes and 3 tbsp of curry sauce, cook until chicken are cooked and potatoes are soft, stir occasionally. When these is little liquid, add in more curry sauce (adjust to personal preference) and salt to taste. The sauce should be of thick consistency. Serve with steam rice. If there’s still lots of liquid in the wok when chicken are cooked and potatoes are soft, remove chicken pieces and potatoes then cook down the liquid a little more, so chicken and potatoes are not overcooked. However, if there’s too dry then add in some hot water. Always to stir constantly especially when the sauce thicken, to prevent burning at the bottom of the wok. A slightly thinner curry sauce is always good for dipping bread.